Drillers all over the world, in every hole-drilling industry are moving more and more to PDC (poly diamond chrystalline) bits for drilling operations in soft to medium hard rock formations. 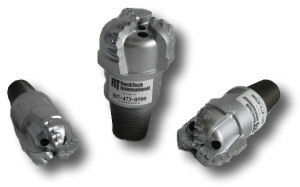 Rock-Tech’s new line of PDC bits are made to compete not only in faster penetration rates, but priced to ensure your cost per foot will be one of the lowest in the field. Bits are available in 3-blade, 4-blade, 5-blade, 6-blade, 7-blade, 8-blade and other custom designs as required.